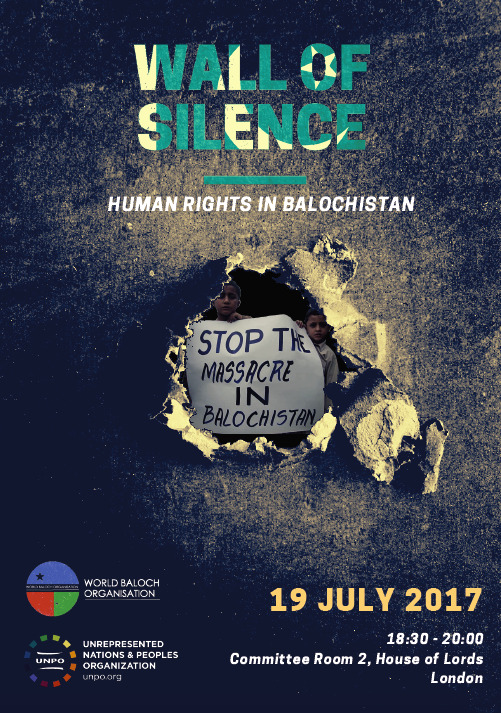 UNPO: House of Lords Conference: "Wall of Silence: Human Rights in Balochistan"
House of Lords Conference: "Wall of Silence: Human Rights in Balochistan"
On 19 July 2017 at 18:30 the Unrepresented Nations and Peoples Organization (UNPO) in collaboration with the World Baloch Organisation (WBO) will organise a conference at the House of Lords in London hosted by Baroness Jenny Jones of Moulsecoomb of the Green Party for England and Wales. Entitled "Wall of Silence: Human Rights in Balochistan", the conference will bring together human rights defenders, academics and policy influencers to raise awareness for the heinous human rights violations taking place in Balochistan, and discuss what concrete action should be taken to put an end to this. The plight of Balochistan, Pakistan’s largest, most resource-rich yet least developed province, and the gross human rights violations perpetrated against its people, seldom surfaces in international media channels or decision-making fora. For decades in Balochistan economic exploitation through the plundering of natural resources and the systematic economic, social and political exclusion of indigenous Baloch people have become commonplace. In addition to this, enforced disappearances, extrajudicial killings and an escalating crackdown on freedom of expression, are used as covert tools to brutally repress the Baloch peoples’ peaceful struggle for justice, rights and equality. Through notorious “blasphemy laws” and their abusive implementation, a wide-spanning censorship reigns in Pakistan, denying a voice and persecuting all those considered to be “anti-state” actors. Recently, namely on May 10 2017, the Pakistan Telecommunication Authority (PTA) sent a text message to millions of citizens warning against sharing “blasphemous” content on social media and encouraging people to report such content. Few days later the interior minister Chaudhary Nisar Ali Khan ordered the Federal Investigating Agency to take action against all those dishonouring the Pakistani military on social media. This all points to a general worsening of the situation of freedom of expression, putting peaceful human rights defenders even more at risk. This intensification of censorship impacts the Baloch people particularly, denied a voice regarding the implementation of the US$46 billion dollar mega project known as the China-Pakistan Economic Corridor (CPEC), by being excluded from all decision-making processes and silencing any dissenting voice. The mammoth infrastructural project will connect Balochistan’s deep-water Gwadar port China’s Xinjiang – home to the oppressed Uyghurs, thus providing China access to the Arabian Sea. Despite Balochistan’s key geopolitical location and abundant promises of development and employment for the indigenous population, as construction has begun none of these have materialised. In fact, Pakistan’s campaign to implement CPEC has been ruthless, with local inhabitants forcefully cleared and any promise of local governance or job opportunities rendered void by the massive influx of Chinese personnel in the region. Furthermore, armed forces have been raiding the houses of Baloch activists, keeping women and children captive as part of a larger campaign to silence any opposition to CPEC. At a time when independent media and international civil society organisations are repeatedly being denied access to the region, this conference will contribute to filling the existing information black hole on human rights violations in Balochistan and to draw attention to these heinous crimes. The event will bring together academic experts and renowned human rights advocates to discuss the challenges and interests at stake, looking at how the international community can support the Baloch people to end atrocities committed against them.